You can always transfer your Yola-purchased domains to another domain provider, but before you do, we want to ensure you understand the benefits that hosting a domain with Yola provides and the hidden costs that are often associated with domain transfers to other providers. Access to an award-winning Sitebuilder and Support team. When you transfer away you will have to pay an upfront transfer cost to the new registrar (at the minimum, this is usually the full annual cost of a domain again). In addition to this, you may also have to pay additional fees for access to premium site building and hosting. We believe our hosting packages offer great features and excellent value. Take a look at the Yola Features Comparison page for more information about them. We'd love to know why you would like to transfer your domain away from Yola. We value this feedback and use it to improve our service. You're welcome to mail us at support@yola.com and we'll be happy to help! Should you still wish to use another site building and hosting provider we recommend pointing your Yola-purchased domain to another provider rather than transferring away. To do this you need to access your domain settings in My Yola and edit your DNS settings. Depending on the host you're moving to, you will either need to edit the nameservers or create an A record (which your new host should provide you with). Your domain will still be hosted with Yola and you will get a renewal reminder from us when your domain is up for renewal. This will allow you to avoid the upfront transfer costs, and to still get the benefit of our premium DNS management services, access to the Sitebuilder and award-winning support for your domain. For more information on this options, please visit this tutorial for nameserver and A record changes. It is important to note that domain registrars require a mandatory 60-day waiting period between purchase and transfers. This is something beyond our control. If it is less than 60 days since you purchased the domain from Yola, you will not be able to transfer it until that period has elapsed. Click Domains along the top toolbar. Click Advanced settings next to the domain that you want to transfer. 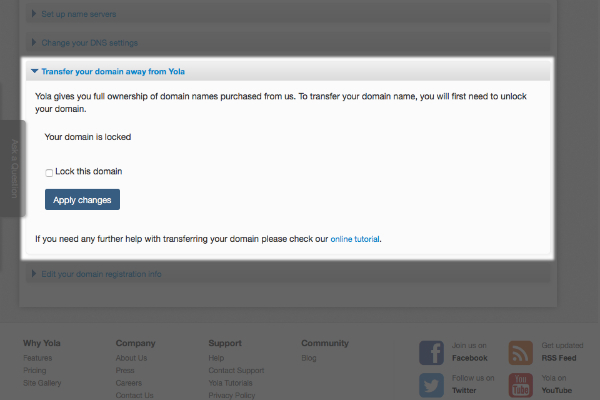 Select Transfer your domain away from Yola. Uncheck the box next to "Lock this domain". Your domain will be unlocked, and you can expect to receive the authorization code in an email from our domain registration partner OpenSRS/Tucows. This authorization code must be provided to your new domain registrar in order to complete the transfer. If you have not received this email within 24 hours, please check your Spam/Junk folders, as it may have been sent there inadvertently. Please note that it can take anywhere between 12 - 14 days for the domain transfer to complete. Important: If you are transferring a co.uk domain away, please read this tutorial: Transfer your co.uk domain to a new domain registrar.